Quantifying selected proteins has uses from systems biology and biomarker assays to fundamental protein interaction studies and protein drug characterization. Perhaps one of the most compelling reasons for LC-MS/MS protein quantification is the ability to support early studies before a selective antibody can be developed for an ELISA assay. In its purest form, absolute quantification requires an authentic standard. With proteins, this is not always practical or even possible. In the absence of a standard, surrogate peptide workflows have been developed. A stable isotope labeled version of a marker peptide is synthesized and purified as a known standard. Protein digestion and quantification of the surrogate peptide is then used to quantify the protein. Several novel approaches have been developed at PharmaCadence to address shortcomings in surrogate peptide workflows. We have assays for angiotensin and several angiotensin fragments available to help elucidate biological pathways and to trace pathway regulation. Ultra-low level detection allows these assays to compete with ELISA sensitivity while maintaining MS selectivity. LC-MS workflows can be effective alternatives to ligand binding assays (LBA) for quantification of antibodies. While routine clinical chemistry analyzers easily measure LDL and HDL in total, the apolipoprotein speciation behind those values contain useful biological information. We have assays for a number of apolipoproteins in several species. We have protein quantification assays in place for all of the major human P450 isoforms, including highly inducible isoforms. Information on protein content of in vitro reagents and tissues allows better scaling of in vitro data to the in vivo situation. Protein quantification can fill the gap between activity data and mRNA data. LC-MS has the ability to measure both small and large molecules. With the proper attention to sample preparation and liquid chromatography, methods capable of monitoring enzyme concentration, substrate concentration, and product concentration are feasible. A number of biologically relevant matrices can be analyzed for targeted protein concentrations including: plasma, CSF, cell lysates, and tissue fractions. Relative quantification does not require an authentic standard and is often sufficient to answer the biological question being asked without requiring absolute measurement of the amount of protein. Mass tags have been applied to multiplex sample analysis and peptide isotope ratio methods have been used to monitor multiple proteins in each sample. 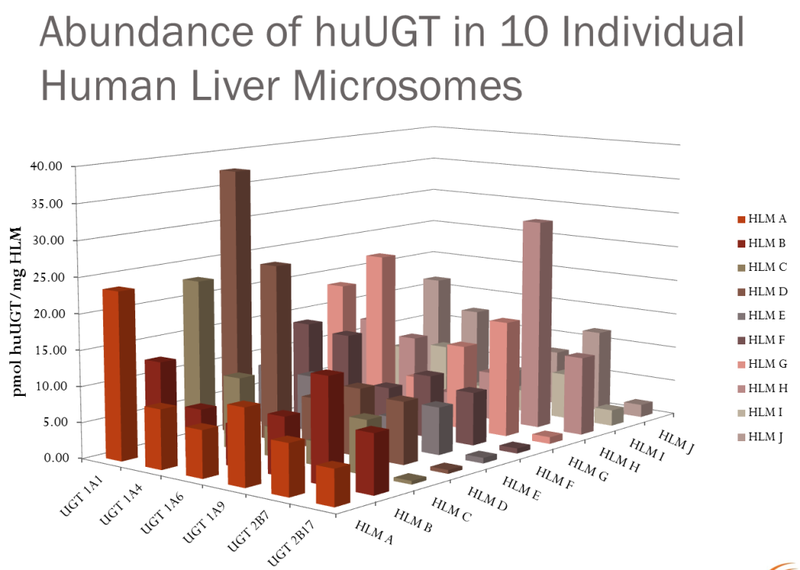 We have assays available for the major human UGT enzymes: 1A1, 1A4, 1A6, 1A8, 1A9, 1A10, 2B7, and 2B17.